I can see the spark in your eyes now, these healthy pear “donuts” recipe feel a bit like a tricky snack for kids right? Don’t get me wrong, donuts can be delicious all on their own, but sometimes helping your kid be excited can all be in the presentation. If you’re looking for a quick, fun treat you can make any day of the week. 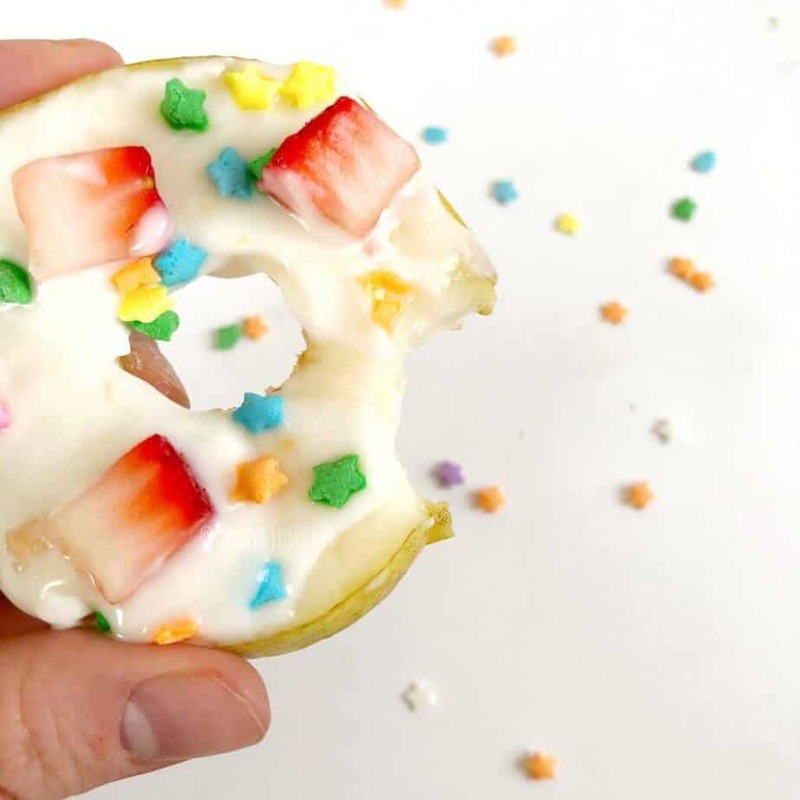 These fun pear donuts are also fun for a crowd or birthday party, and everyone can decorate their own! *This post may contain affiliate links, which I only share for products I truly love. If you purchase using my links I may receive a small commission at no cost to you. The EZPZ play mat used in this post was gifted from the company, please see my full review of the EZPZ play mat here. These pear donuts feel fun right? 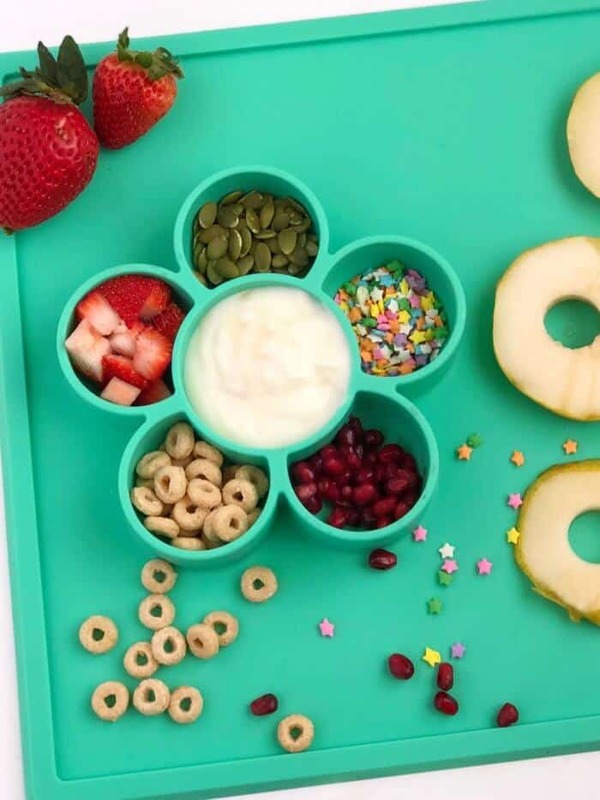 I’m not sure if it is the sprinkles or the yogurt “frosting” but once you start laying out the ingredient, you’re going to have trouble keeping your kid’s hands off of this easy healthy snack recipe. There are plenty of laughs to be had because this is one of those recipes that is also great to get kids in the kitchen helping too. We ate pears often when I was a kid, and they were always one of my favorite fruits. They can be a bit tricky to guess when they will be ripe. Often when you are picking pears in the store they are still hard, so here’s my trick for pears. Use your nose! If the pears smell lovely, when they ripen they will taste delicious. I usually pick pears for our house knowing they are an “end of the week” fruit, as they often take a few days to ripen up. That also makes these healthy ‘donuts” a great end of the week snack! 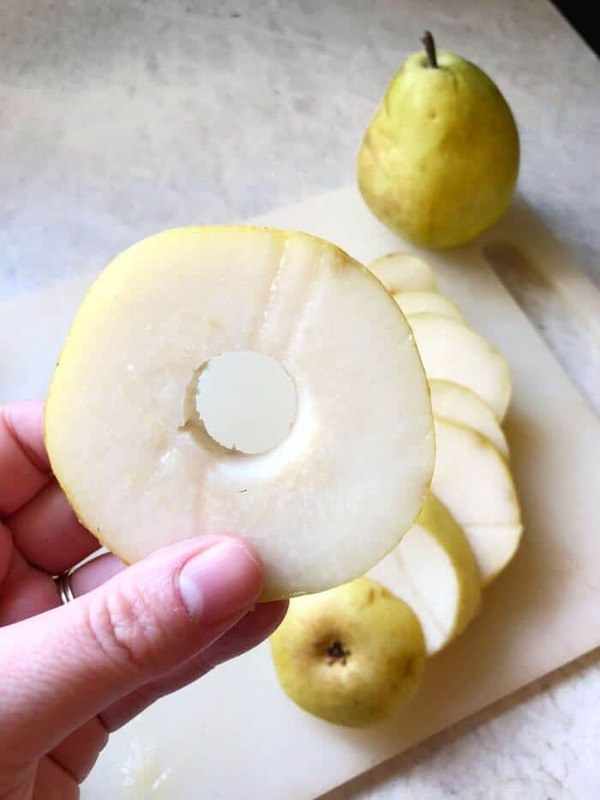 Start by slicing your pears in rounds. A good pear will be a bit juicy, which makes them delicious. My pears were a little damp, but it makes them extra delicious. While you are slicing dice up your strawberries or any other fruit “toppings” and lay out your other toppings. We used our EZPZ Play Mat with all of its great compartments to hold our toppings. I especially love that the yogurt can go right next to all of our sprinkle choices! 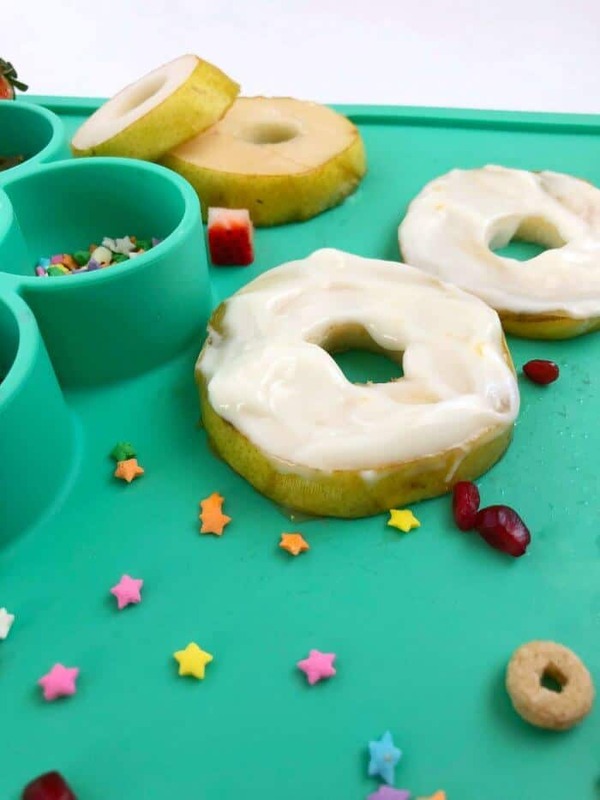 Check out the play mat we used when making these pear donuts: The Flower Play Mat: Make Play Time Less Messy! Then start spreading your yogurt as frosting. You could color the yogurt if you like, or use flavored yogurt. I used plain vanilla, and the sweetness from it was delicious with the pears and the toppings. I may have had a whole pear’s worth myself, and kids are generally happy to eat these too! See they look great right? If your pears have a few small knicks, don’t be concerned. I sometimes will slice out a brown spot, but a tiny knick is going to just get covered in yogurt anyways. Then spread your yogurt or let your child spread the yogurt as frosting. Now to the fun part, add the toppings. Add ALL the toppings! This is where your kids can get really creative! the mat keeps all those sprinkles and toppings in one place for us, and has a work surface for our “donuts.” It sure made cleanup easier. You can also make “donuts” out of apples. Check out in this video, it’s very similar whether you choose pears or apples as the base of your donut. You can learn more about my friend Raizy Fried who creating this apple donuts video by checking out her instagram raizyscookin. 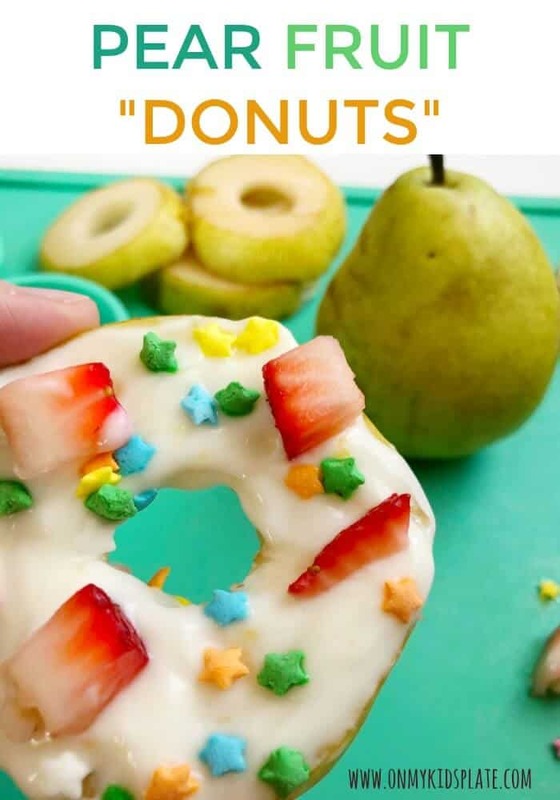 These easy and delicious pear fruit donuts are a fun snack for kids that they can make themselves. Help them to slice the pear and take the core out, then let them frost with the icing and go crazy with the toppings. This simple snack for kids is fun for them to help make. Slice your pear into round circles, you will be cutting right through the core. 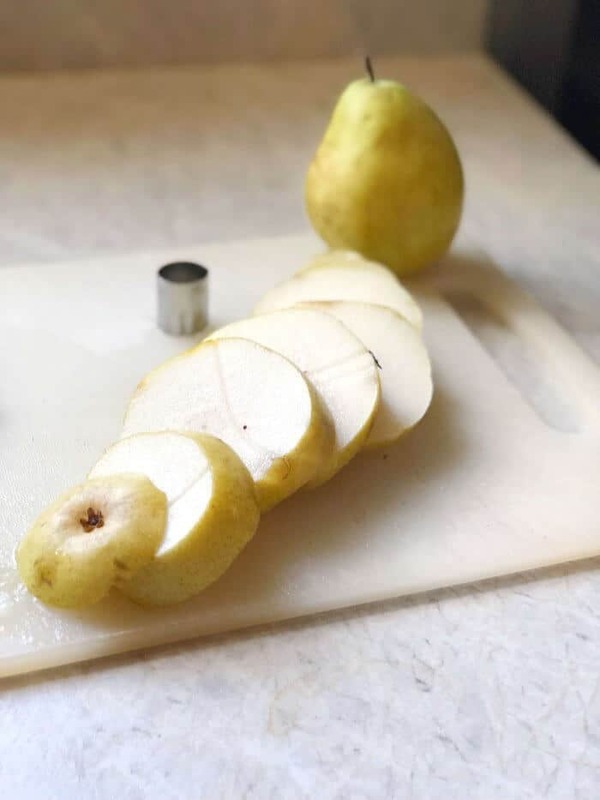 Remove the core of the pear to create an "O" shape. Use a small cookie cutter or melon baller. Using a knife or the back of a spoon, "frost" your pears with yogurt. Add fruit, cereal, sprinkles and enjoy! To cut out the core smoothly in the center you can use a small cookie cutter or a melon baller. Sunflower seeds, walnuts, slivered almonds or granola can all easily be substituted for the pumpkin seeds. Use the code EZPZFREESHIPPING to get free shipping off the EZPZ play mat if you are interested in one for your favorite little to hold all the toppings! Speaking of which, let’s talk toppings! 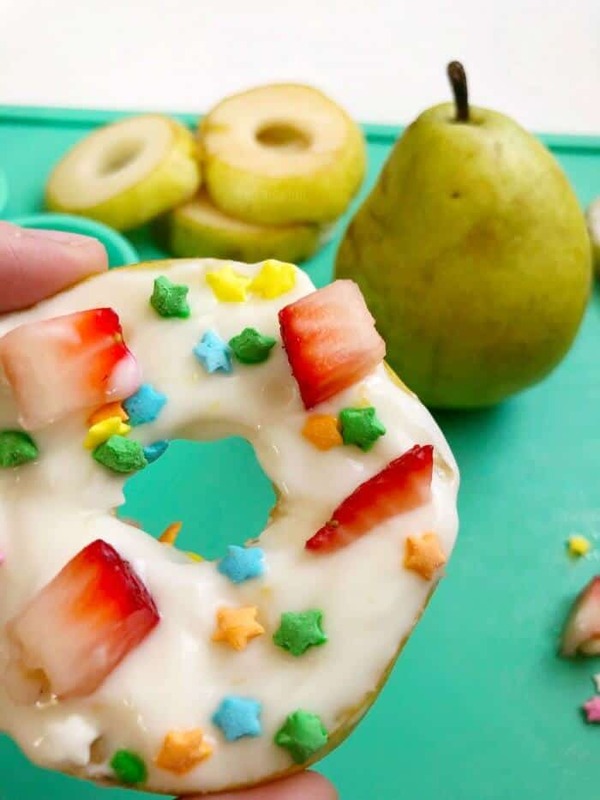 What are you putting on your pear fruit donuts, tell me below in the comments! Spark in my eye? How did you KNOW??? Actually it was the star sprinkles that caught my eye first, but then the word “donut” stole my attention. We make them sometimes, but our recipe involves, erm… lard… I can see this also being a great way to occupy small hands with “making” their own snack. The idea of using vanilla yogurt sounds yummy, I can imagine the flavors combining beautifully. Question: did you use Bartlett of D’anjou?